My first show on day 2 and what an impact it made! From the first look that hit the runway everyone was transfixed, ooohhhhing and aahhhing in silence (as was I) and as usual the stand out head piece being centre of attention. Major ruffle envy was at the forefront of the collection, with bursts of garnet red, midnight green and white hues amongst contrasting textures of winter lit tweed, crochet and his signature silk georgettes and organzas. My favourite piece of the collection was the tulle skirt with delicate flowers attached displaying a more sculptured silhouette. 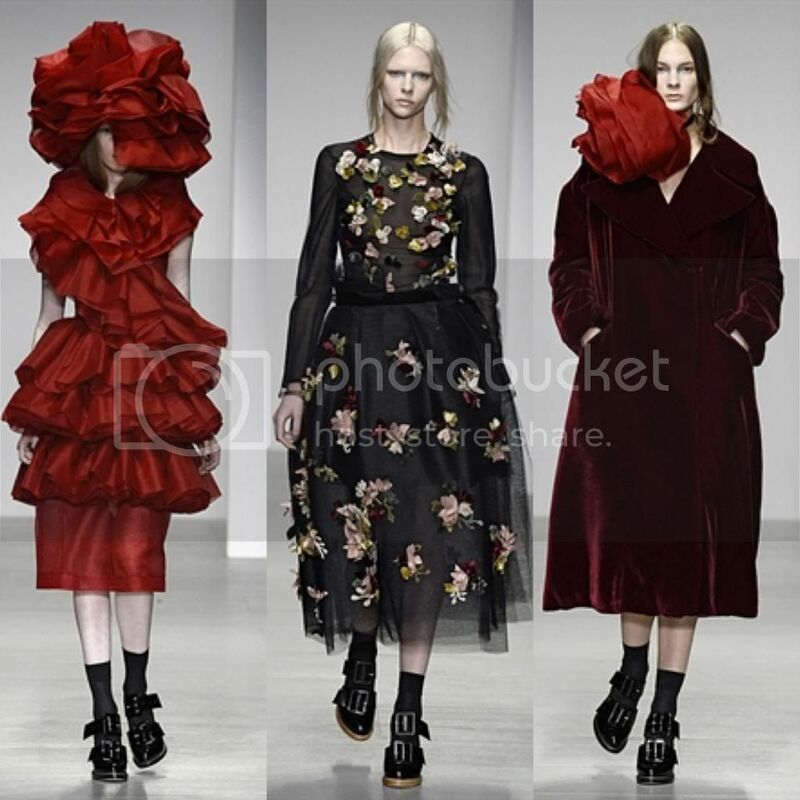 The red velvet oversized coat with an enormous rose attached literally made my heart skip a beat, a much needed piece required in my closet! A collection signifying strength and beauty combined. The HOH show is always very exciting as you never know what Holland will produce. This season the collection was super sophisticated and fun with a capital F full of colour from bright greens, orange, reds, cobalt blues to purples....MAJOR love! Added to this a bomber jacket with the words 'Rich Bisch' and a tee that emulated the Sun newspaper, he kept his personality at the forefront. Sam Rollinson, Britain's Next Top Model winner headed the show in a fur coat, satin joggers and the cutest fluffy pom pom slippers. Even Henry dabbled in the full skirt trend with a silver matching two piece combo. More was more in a good way, I look forward to see how he will interpret his ready to wear line in Debenhams. 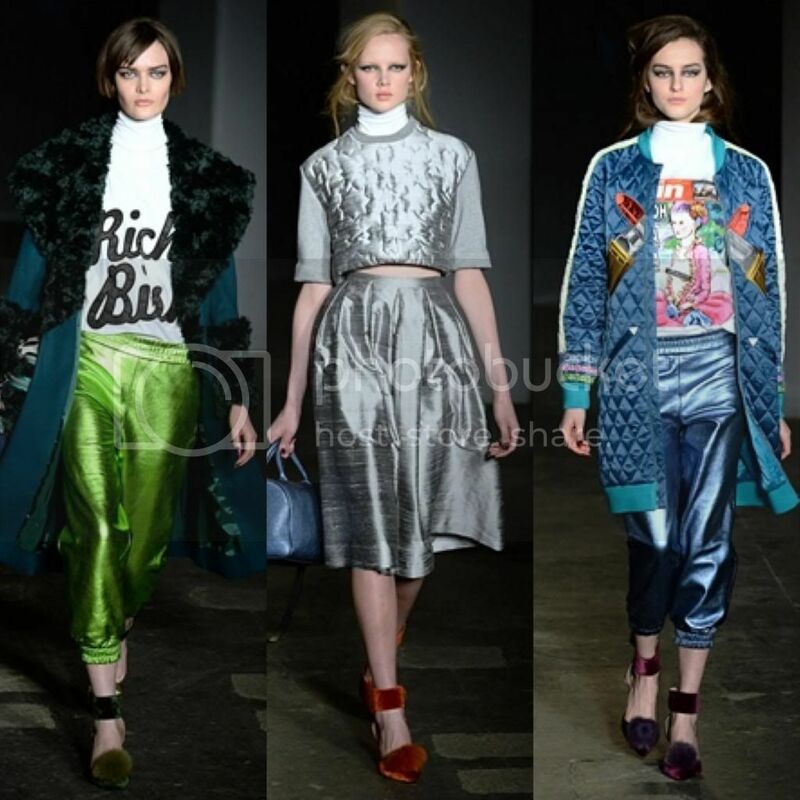 Hunter Original, British heritage brand dating back nearly 160 years showcased their AW14 lifestyle ready to wear range at LFW for the first time ever! Now offering outerwear, knitwear, accessories, as well as footwear, this was one show that everyone wanted to view and luckily for us it was streamed online. 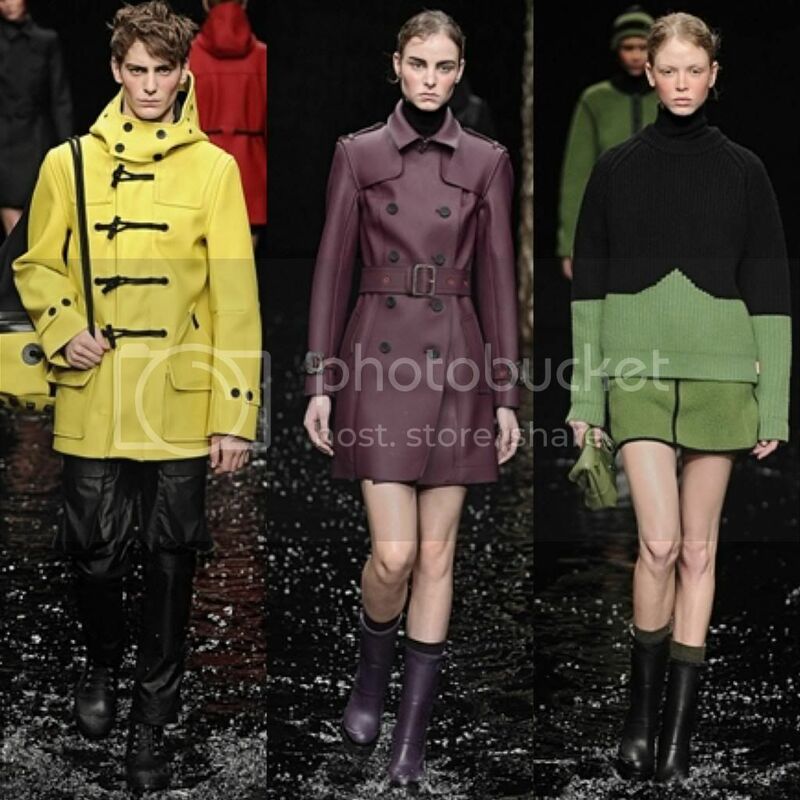 Iconic for their Hunter wellies, creative director Alasdhair Willisthe focused on rubberised and neoprene outerwear, longline duffle coats and ponchos with models strutting down the runway splashing their heeled hunter clad feet through puddles of water. That was a truly beautiful experience! Thank you for the great review! The AW14 collection will be available in the store from June 2014. John Rochas perfectly reminded me of the vast tulip fields of Holland :) everything is so pretty, like the House of Holland, very beautiful! Ahhh it was an amazing show! Yes I agree so simple yet so powerful combined!